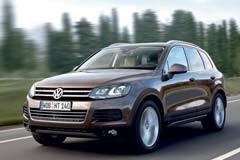 If you are thinking of buying a used Volkswagen Touareg, you need to do a bit of research to learn about the car model. This is a mid-sized SUV that has been in production since 2002. This particular model is less expensive than the other Volkswagens in order to gain some mass-market appeal. However, it is still a genuine luxury vehicle. The base can be compared to the Porsche Cayenne and it features very impressive specifications. It is very comfortable to drive and has a very ergonomic and functional interior. It features very clean lines and has changed very little over the years. The main change it has gone through is a minor exterior facelift. What is most impressive about the Touareg is its towing abilities. For a vehicle in its class, it also has good fuel economy. 2010 Touareg V6 Black Volkswagen Touareg with 151744 Miles available now!